SINGAPORE (THE NEW PAPER) - One thing led to another in a chain of events on the Central Expressway (CTE) in the wee hours yesterday. It began with a man trying to kill himself on the Braddell flyover of the CTE, which later led to two accidents in which three people were injured. The police and Singapore Civil Defence Force (SCDF) arrived at the scene after the police were alerted to the case of attempted suicide on the CTE flyover at 2.45am. A 38-year-old man was later arrested in relation to the case, the police told The New Paper. 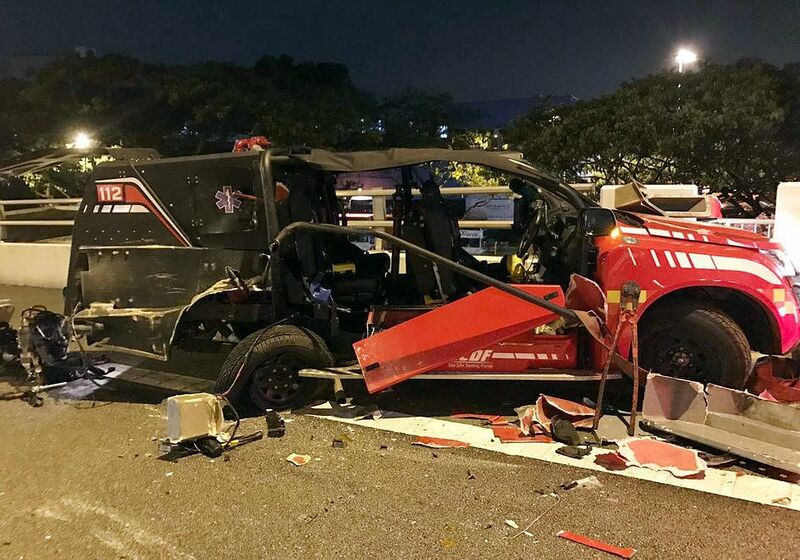 Then at around 3.10am, a van collided into a SCDF Red Rhino fire vehicle that was parked on the Braddell flyover road shoulder towards the Seletar Expressway (SLE). An ambulance was also damaged as a result of the collision. After the collision, the van skidded about five metres and toppled on its side. The 69-year-old van driver, complained of pain in his chest area, while a 20-year-old SCDF officer, who was sitting at the back of the Red Rhino, had abrasions on his arms and legs. The police said both victims were taken to Tan Tock Seng Hospital (TTSH). The SCDF officer was discharged and given two days of medical leave. Not long after the first accident, just 10 metres away, a car crashed into the rear of a taxi. SCDF officers at the scene attended to the victims of the accident. A female passenger in the car said she felt giddy and the back of her head was hurting. The woman, who is in her 20s, was also taken to TTSH in an ambulance. The Land Transport Authority said the two accidents affected four of the five lanes on the CTE in the direction of the SLE.